Clinton was in the country both to meet with Saakashvili and to attend the third annual plenary session of the U.S.-Georgia Strategic Partnership Commission, which was created five months after the five-day war between Georgia and Russia in August 2008. “Madam Secretary, I will speak in English. They have heard me already speak in Georgian many times.” Columbia University graduate Saakashvili and former carpetbagging senator from New York Clinton speak a common language in more than one sense. In the earlier meeting of the Strategic Partnership Commission, Clinton was accompanied by Joseph McMillan, Principal Deputy Assistant Secretary of Defense for International Security Affairs, in which capacity he is described by the Pentagon as “oversee[ing] the formulation, coordination, and implementation of strategy and policy involving Africa, Europe and NATO, the Middle East, and most of the former Soviet Union.” The two met with a Georgian contingent headed by Defence Minister Bacho Akhalaia. “Self-defense” is a reference to Russia, which will defend South Ossetia and Abkhazia against any new acts of aggression perpetrated by Georgia. The NATO-Georgia Commission is an initiative established the month after the Georgian-Russian war of 2008 and the Annual National Program was launched two months later under its auspices to promote Georgia’s full integration into NATO by circumventing the traditional Membership Action Plan. Russia was not long in reacting to Clinton’s pronouncements. In regard to Clinton’s announcement that the U.S. was stepping up training of the Georgian military, the U.S. Marines Corps has been training the country’s armed forces since 2003. Two months ago 300 U.S. Marines were in Georgia to lead the two-week Agile Spirit 2012 military exercise. In July of 2008 1,000 U.S. Marines led the Immediate Response 2008 exercise in Georgia, which ended on July 31, a week before Georgia’s invasion of South Ossetia. American troops and equipment remained in Georgia during the ensuing war with Russia and U.S. military aircraft flew 2,000 Georgian troops back from Iraq to join the hostilities. “It was the active encouragement from the U.S. and other Western states, commitments about accepting Georgia into NATO and the massive supply of armaments from abroad that formed a sense of all-permissiveness and impunity for Mikheil Saakashvili, which pushed him to commit a criminal adventure in South Ossetia. At the time we had to bring the aggressor to his senses. The day after Clinton’s departure from Georgia, Deputy Secretary of the National Security Council of Georgia Batu Kutelia said that the decision to expand military cooperation between the U.S. and his nation was reached at the one-on-one meeting of presidents Obama and Saakashvili in the Oval Office of the White House in January of this year. 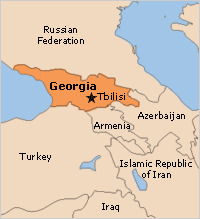 The Georgian – and American – definition of defense has already been commented upon and is evidenced by the war against South Ossetia and the deployment of U.S. Marines Corps-trained Georgian troops to Iraq and Afghanistan. In recent months speculation has been rife, including a statement to the effect by former Georgian president Shevardnadze, that Washington intends to employ military assets in Georgia for an attack against Iran. Adding to the Saakashvili regime’s arsenal and emboldening the reckless American client with carte blanche backing will threaten peace even beyond the Caucasus.